Squid can blend in perfectly with their surroundings. But new research shows that their dual-layered skin allows them to communicate with one another using polarised light, without ever compromising their perfect disguises. Two strangers are having a normal conversation in the middle of a large crowd. No one else can see them. No one else can listen in. Thanks to advanced gadgetry, they are talking in coded messages that only they can decipher. These invisible conversationalists sound like they’ve walked out of a Bond film. But they are entirely real, and their skill at secrecy is biological, not technological. They are squid. Squid and their relatives, the octopus and cuttlefish, are masters of concealment. They have the most sophisticated camouflage abilities in the animal kingdom and use them to avoid predators who would gladly feast on their soft shell-less bodies. Their remarkable abilities also allow individuals to communicate with each other through a rich vocabulary of colour-changes and body postures. But in doing so, they face a problem – how can they signal to each other without compromising their finely crafted camouflage? Lydia Mathger and Roger Hanlon at the Marine Biological Laboratory, Massachusetts, have the answer and it lies in the squid’s dual-layered skin. The top layer consists of specialised sacs of coloured pigment called chromatophores, which can expand or contract on command. By switching them from concentrated specks to wide, flat plates, the squid can produce rapid bursts of colour. But the key to secret signalling lies in the bottom layer. This consist of cells called iridophores, which contain stacked plates of protein separated by liquid. When light hits each plate, some is reflected but the rest passes through to the other plates below. The squid can control the size of the gap between the plates, so that they match the wavelength of different colours of light. As a result, the multiple reflections add up in precise ways and reinforce each other, producing intense bursts of colour. This is known as iridescence. Mathger and Hanlon found that as the iridescent light passes the top layer, the squid can modify its brightness and colour by expanding the chromatophores over it (the dark blobs on the left image). The iridophore’s light allows the squid to cope with colours like blue and green that the chromatophores don’t contain, and refines its ability to blend into the background. The two layers, by acting together, represent the ultimate in subterfuge technology. But the same structures that produce iridescence also do something special to the reflected light – they polarise it. We can think of light as a wave that vibrates in every possible direction as it moves along. The effect is similar to a piece of string attached to a wall and shaken it in all directions. But polarised light vibrates in just one direction – imagine just shaking the piece of string up and down. Squid and their relatives have eyes that are sensitive to polarised light and to them and are known to use it to signal to one another. Their predators on the other hand, like seals or whales, don’t share this ability and cannot see the squids’ signals. Most of all, the polarised iridescent light, is not affected by the chromatophores and passes through unaltered. This means that camouflaged squid can have entire visual conversations while remaining invisible to passing predators. In the world of squid, conversations carry secrets wrapped in lies. In the natural world , mimicking a more dangerous creature is a common strategy for avoiding predators. 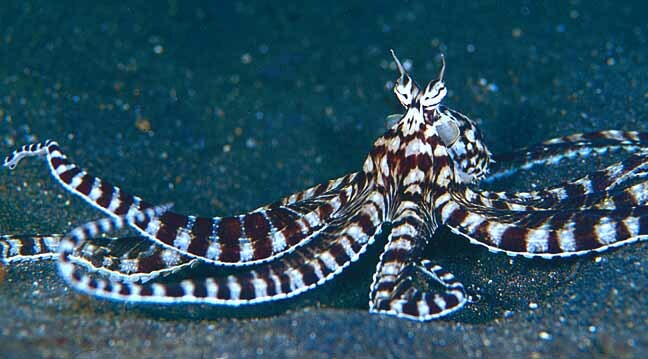 But there is only one animal that can dynamically mimic many different creatures – the incredible mimic octopus. As you swim through tropical waters, you notice that a strange creature has entered your territory. The intruder is unfamiliar, but when you try to chase it away, it undergoes a startling transformation. Its new form is one you recognise – a banded sea-snake, highly venomous and likely to make you its next meal. You turn and flee. You are a damselfish, you are in Indo-Malayan seas, and you have just been duped by the mimic octopus. The mimic octopus is new to science and has yet to be properly classified *. It has, though, already gained notoriety for its unique ability to impersonate venomous or distasteful animals. Politicians and pop-stars may be beyond its scope, but its repertoire includes soles, lionfish, sea-snakes, and possibly sea anemones, stingrays and jellyfish. To transform into a sea-snake, for example, the octopus withdraws its head and six of its tentacles into a burrow and waves the other two in opposite directions in an uncannily serpentine manner. You can download some Quicktime videos of the octopus doing its thing from the Royal Society website. Octopus specialist Dr Mark Norman, from the University of Melbourne, Australia, first observed the mimic off the coast of Indonesia. There, it forages in open sand flats during broad daylight and its talents may have evolved to keep it safe in these vulnerable surroundings. As Norman says, when you’re caught in the open by a passing fish, “you’ve got to look either deadly or inedible”. Mimicking deadly or inedible animals reaps obvious benefits – predators avoid you, and you need not bother making poisons yourself. It has therefore become a common strategy, used by snakes and flies, spiders and plants. But these charlatans are all one-trick ponies. In comparison, the mimic octopus’s charades are orders of magnitude more dynamic. “No other animal has been found that is able to rapidly change between different forms of mimicry”, says Dr Tom Tregenza, from the University of Leeds, UK, co-author of the paper which first described the mimic. Having multiple acts benefits the octopus as predators are less likely to catch on to any individual one. If too many octopuses mimic a single creature – say, a lionfish – then predators are more and more likely to encounter the fake than the real deal. They might never learn that something that looks and moves like a lionfish is not worth biting. Like all good performers, the mimic octopus caters to its audience. It only acts like a sea-snake (right) when confronted by territorial damselfish, which are preyed upon by sea-snakes. “This is very exciting because it raises the possibility that the mimic octopus can employ different forms of mimicry to counter different threats”, says Tregenza. But is the mimic actually mimicking or are human eyes misinterpreting these movements? To answer this, a BBC/Discovery film crew captured six hours of live footage of the mimic in 2000. The combination of colour, posture and very “un-octopus-like” movement convinced many sceptics. For example, when mimicking the leaf-shaped sole, the octopus not only draws its tentacles and head back into a leaf shape, but also matches a sole’s colours and undulates its body to resemble its swimming style. Norman believes that octopuses as a group are the equivalent of “rump steak swimming around”. Their bodies lack any sort of protective shell or skeleton and they have had to evolve other incredible defences to compensate. Soft bodies make them vulnerable, but they also make octopuses particularly well-suited to deception. Without skeletons, they are expert contortionists, and can change shape or squeeze into tight spaces. Their remarkable skin can change texture, becoming spiky or smooth on a whim. It also contains sacs of pigment called chromatophores which can be expanded or contracted to produce rapid changes of colour and pattern. Armed with this arsenal of stealth, all octopuses are masters of disguise. Most species are content to blend into their backgrounds. The mimic’s ancestor probably lived unnoticed in nearby coral reefs. These reefs are like busy and crowded high streets; in contrast, the sand flats are an open market, with rich pickings for any animal (provided that they can avoid being eaten). The octopus’s inbuilt camouflage abilities would have given it a head-start. As time passed, individuals that slightly resembled poisonous animals would have lived longer without being eaten, allowing them to pass their appearances on to their offspring. The mimic’s behaviour remained undiscovered for years because its dull homelands are poorly studied. But it is precisely this barren nature that has provided the impetus to evolve such amazing behaviour. As Tregenza says, “The mimic octopus teaches us that very bland and barren habitats may be home to the most impressive behaviours.” Even more surprising and wondrous animals may await discovery in these unexplored worlds. Reference: Norman, Finn & Tregenza. 2001. Proc Biol Sci 268: 1755-1758.